The Lyrid meteor occurs every mid-April as Earth passes through a stream of dust left over from the comet Thatcher. Normally you can see 10-20 meteors/hour, but sometimes burst up to 100. 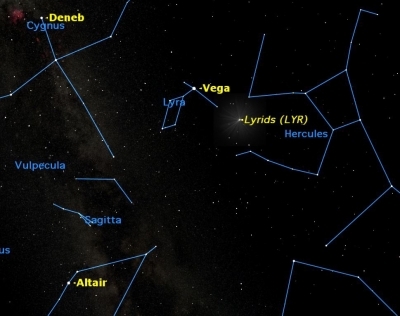 The radiant point is near the constellation Lyra which will be in the northeastern sky around midnight, but meteors can be see in all areas of the sky. Even though we won't be able to catch the show, NASA scientists plan to have it covered. They are employing a network of all-sky cameras on Earth, a balloon launched by students in California, as well as scientists on the International Space Station to capture images from space.